1. How are your Sheds Delivered? Do you Build on Site? Yes,we do build on site.We Can Deliver your shed in Two ways. The first and most common is Built on Site Installtion. We Build on Site at No Additional Cost on All New Shed Orders. The Second is Pre-Built Delivery. We build your entire building in our shop then deliver it using one of our Hydraulic Shed Trailers.This delivery method requires adequate room to get the building from the street all the way to the intended location.Sheds larger than 10x20 are always Built on Site Only. Click Here to View our Delivery Page. 2. How do I prepare the ground for my Shed.? You can prepare the ground in several ways or we can provide all of the methods listed. -Cement Blocks placed under the buildings support runners and when neccasry wooden shims are placed on top of the block to make sure the building is level. Wooden Shims or Cement Blocks are included within The Cost of Your Shed as long as the Ground is less than 8" out of Level. -A Gravel Pad Created by removing 4" of Sod and fill with 3/4" Crushed Gravel. Gravel Must Be LEVEL. Please Call for more Information. -A Concrete Slab can be used. Pour a Slab at least 4" thick, make it 1" Smaller than the floor Size of Your building. Please Call for more Information. Concrete Must Be LEVEL. -Wooden Posts or Piers can be used in extremly unlevel Areas. Please Call for more information. -We Can Provide all of the above listed Methods. All Sites Must Be LEVEL. 3. Is a Gravel or Concrete Base Required? No. Most of our Sheds are installed on Cement Blocks that we provide for No Extra Cost. We will install a gravel base for our sheds for the following prices. Additional charges apply beyond 12" at the deepest point. 4. 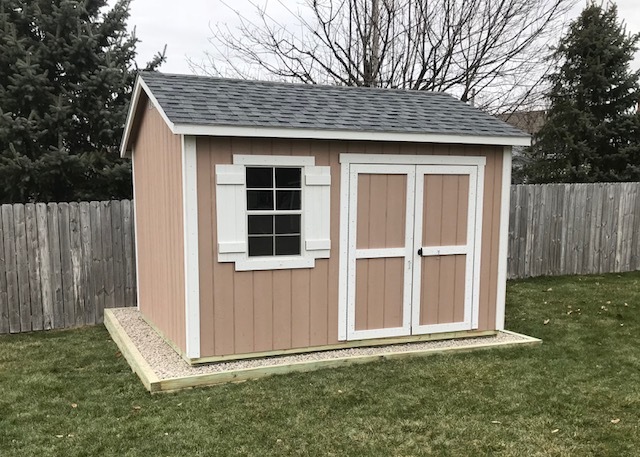 Do you sell "Shed Kits"? No, We only sell Completed Sheds. 5. 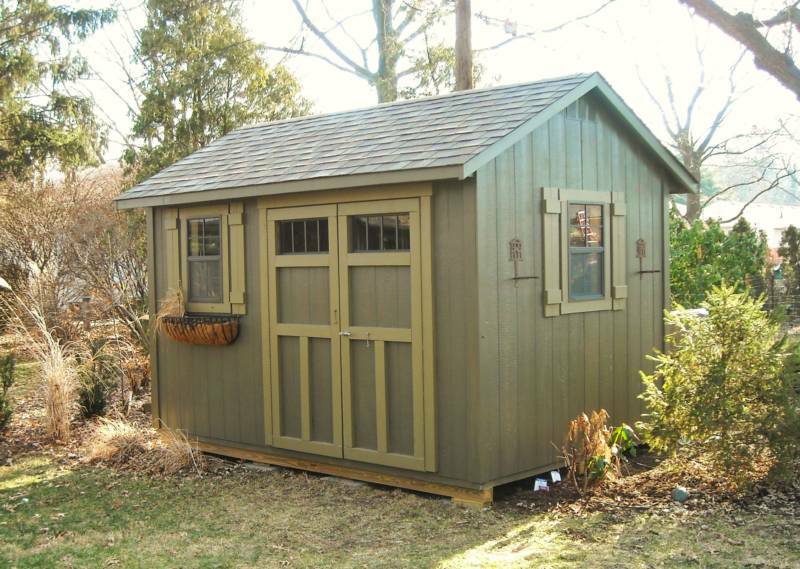 Do your Sheds Included a Floor and Shingles? Yes. We Sell Complete Sheds for a Striaght forward Price. All Prices Include Leveling your shed, The Floor, The Doors,A Locking Door Handle, Shingles & Delivery. 6.What does the Shed Delivery Cost? 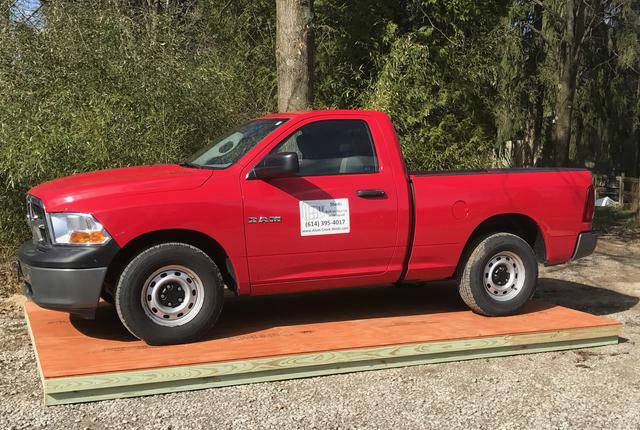 The delivery is included in the cost of your shed within 50 miles of our shop in Sunbury, Ohio. Delivery is $3 per loaded mile after the first 50 Miles. 7. Do I need a Building Permit for a Shed? It depends on where you live. In Columbus, Ohio you can build a Shed up to 169 Square Feet without A Permit. However many areas do require a permit. Also check with your homeowners association. We have Structual Drawings for you to take to your local building Department if needed, but we do not get permits for you. 8. Can the shed floor support my lawn tractor? 9. I want a shed right away,Do you have sheds in stock Ready for Delivery? Yes. We have sheds in stock at all times that can often be delivered within the same week. They can be seen on our Lot and by Clicking Here on our website.